The painting “Roses in blue jugs” is the most famous of the series of paintings dedicated to the rose. In total, the artist has created more than 20 still lifes on this subject. The inspiration for writing still life was the abundance and beauty of rose gardens in the Crimean Gurfuz. Arriving at the Gurfuz dacha, Konstantin Alekseevich brought with him his collection of vases and jugs. 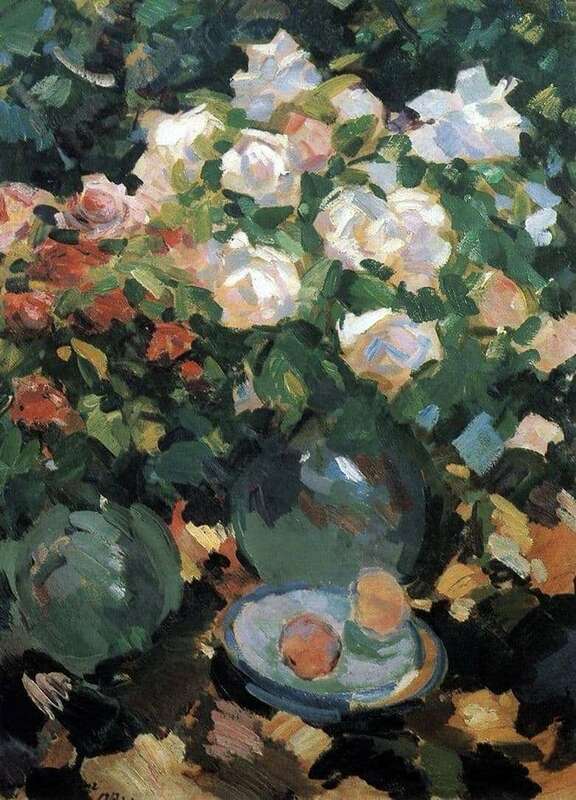 Already, being keen on writing flower still lifes, Korovin believed that a particular vessel should be chosen for each bouquet. Konstantin Alekseevich treated bouquets as a piece of music for the eyes. According to the artist, the bouquet should sound, and for this you need to choose a vase for it well. For each of his works, Konstantin independently composed bouquets. “Roses in blue jugs” was written in 1917. This picture is amazing, it is impossible not to stop before it. Still life as if filled with sunlight. Roses look spectacular and luxurious. The picture personifies the real hymn of life and happiness. The technique of execution of the author of the picture shakes the scope of the brush. Rose – is a symbol of love. Each stroke conveys the author’s sensuality and temperament. Considering the canvas, you can understand without even reading the captions that the picture was painted by a man, cheerful and loving. The picture shows not just flowers as an interior decoration, but flowers, personifying feelings, bouquets, like a love melody. All this can be understood by drawing attention to clear, precise and sweeping brush strokes, a combination of colors. There is no plot of the picture in the image, which emphasizes the individuality and beauty of the roses depicted on it. Korovin always loved to amaze the viewer with aesthetics and beauty. In his still life, Constantine depicts not only flowers, but also various objects, such as jugs, a dish with apples. These objects add a special meaning to the image, a certain intimacy of the situation.